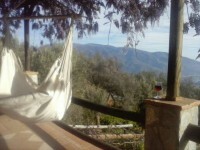 Casa Nevada sits in an ancient terraced olive grove and was self-built by the owners to a high standard, with many unique features. 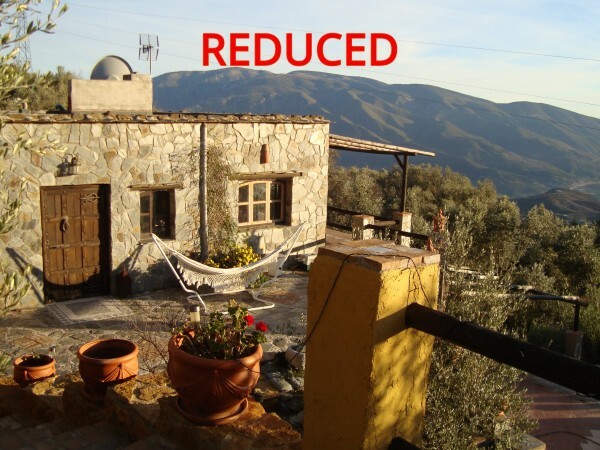 Built in traditional Alpujarran style, the house has a south facing terrace not only with panoramic views of mountains, a lake and the sea, but on a clear day the Rif Mountains in Morocco. The terraces have been creatively landscaped to include several productive fruit, vegetable and ornamental gardens, all organic that have been opened to the public in recent years to raise funds for local charities. 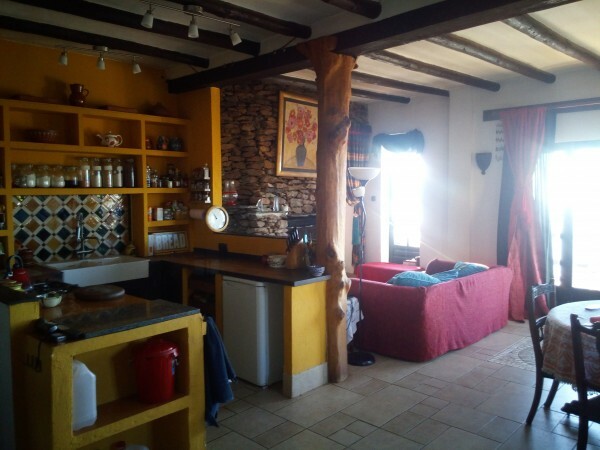 The main house has a large airy, beamed open plan kitchen, living, and dining room that opens onto the terrace to make the most of outdoor living, possible in southern Spain for most of the year. The layout is a great social space for entertaining family and friends. There is an impressive stone fireplace that is double sided with the master bedroom, providing plenty of warmth in the cooler winter months. 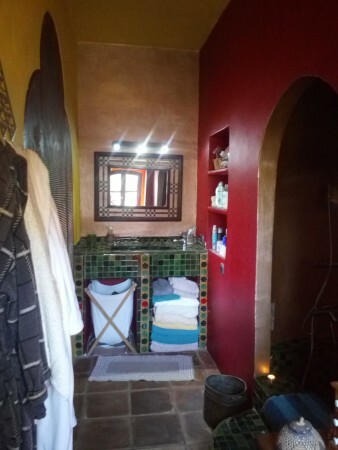 The master ensuite bathroom has its own sunken Moroccan bath, with local handmade tiles and integral lighting. An extensive range of bespoke, locally crafted wardrobes provide extensive storage in the bedroom. The kitchen is open plan with plenty of storage, a cooker, fridge and an interesting tree feature. There is an additional cloakroom and utility/store room with washing machine in the main house. 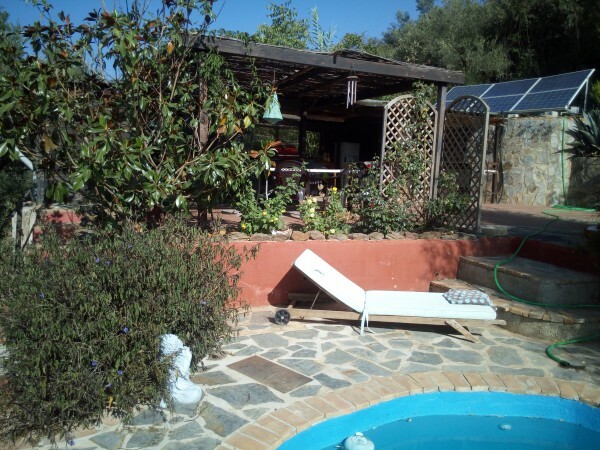 The house was designed and built to make the most of the winter sun through passive solar heating and to keep the house cool during the Spanish summer. To maximise the outdoor living there is a wooden pool-house with a fully equipped kitchen and dining terrace, next to the swimming pool, making a superb entertainment area for many months of the year. The landscaped gardens offer breath-taking views of the surrounding countryside and have been carefully nurtured over the last 14 years to give colour and interest all year round. Due to the longer growing season the vegetable garden provides produce all year round. 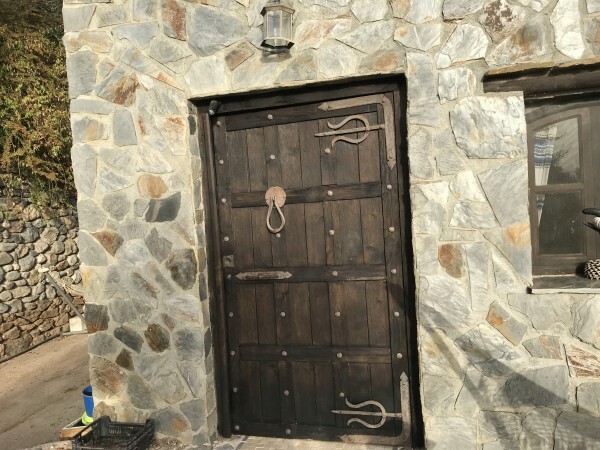 There are additional outbuildings, including a potting shed, workshop and stone casita that could be converted into additional living space, presently used as an office. 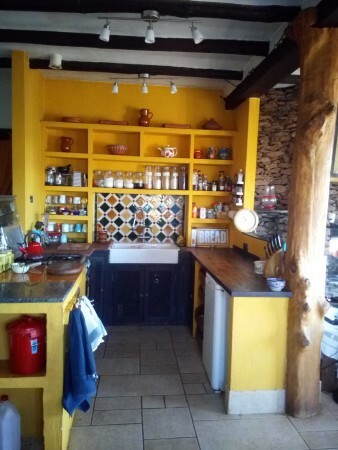 The house is off-grid so the power comes from solar panels that provide sufficient electricity for a comfortable lifestyle including lighting, fridge, freezer, washing machine, TV, wi-fi etc. The house water is snow melt from the Sierra Nevada and is stored, and filtered before use in the house. There are nearly 200,000 litres of water storage in a number of depositos, on the plot that with a little management is more than sufficient for everyday general use. Drinking water comes from the village, where the natural springs are available for everyone to use. Grey water from the house goes through a series of reed and vetiver filters and is re-used on the garden, whilst the toilet waste has a septic tank. 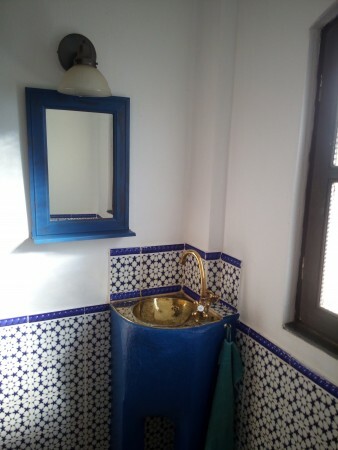 There is also a fully functional compost toilet near the pool house, for use when using the outdoor dining area and pool. Many dream about escaping the rat race and living a simpler, healthier, greener lifestyle away from the pressures of modern day life. 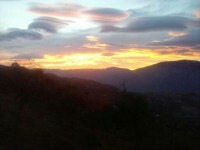 Casa Nevada is a unique opportunity to experience an incredibly rewarding lifestyle in what can only be described as a stunning location, with potential to earn an income. 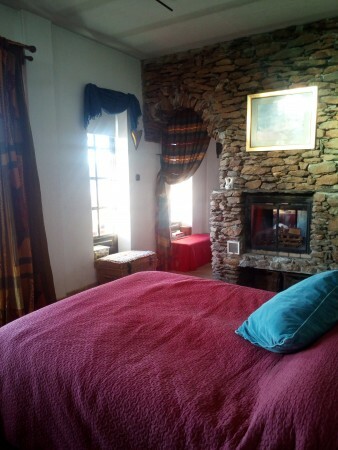 Casa Nevada sits in the foothills of the Sierra Nevada that are the second highest mountain range in Europe, and enjoys all four seasons from amazing almond blossom and wildflowers in the Spring , lazy languorous Summers, glorious Autumn colours and a smattering of snow in Winter. The house has been designed and built to make the most of living in southern Spain, with sunny terraces and shady areas to suit the time of year. Where else can you sit on a terrace enjoying breath-taking views whilst watching eagles soar on the thermals and then bask in the sight of the Milky Way at night. 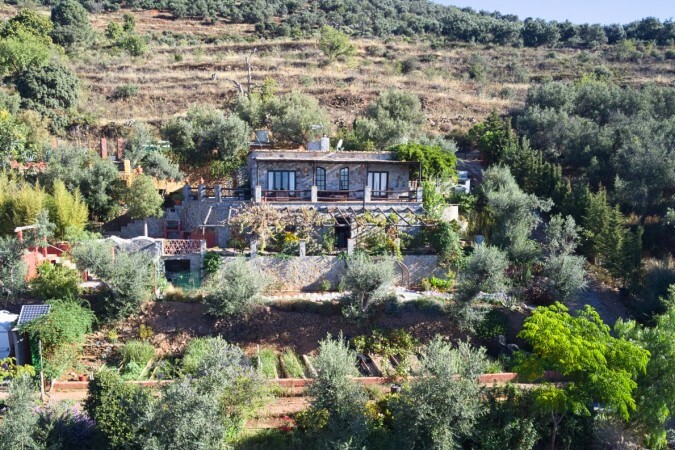 The ancient terraces, first built by the Moors hundreds of years ago, have been carefully designed and nurtured to provide several productive terraces of fruit and vegetables. 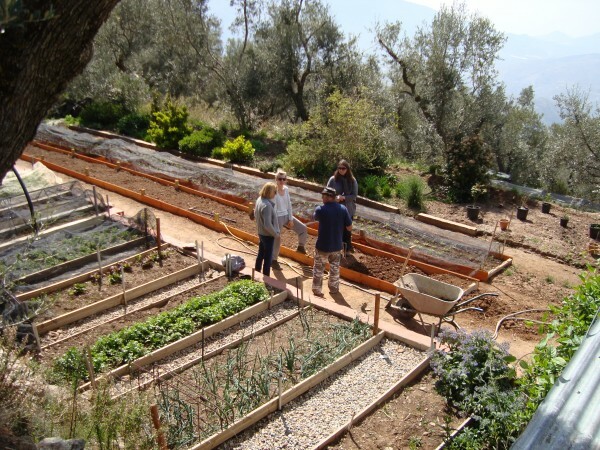 For over 7 years the land has produced organic salads and herbs, that were sold to local restaurants, hotels and yoga retreats. The productive garden is supplemented by local foraging for wildflowers and herbs, that formed the basis of walks and courses runs by the current owners to encourage people to understand their environment better and make use of the free plants to be found in the local countryside. There is simply nothing better than picking your own lunch, the flavours and freshness are unsurpassed. To be able to sun dry your tomatoes, preserve them in your own olive oil and enjoy the flavour in the depths of winter is something few people get to experience. 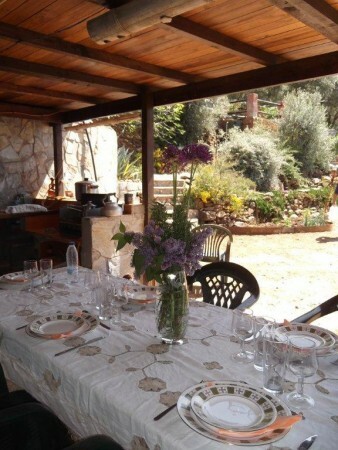 The local goat farmer provides fresh unpasteurised goats milk, for drinking and for making cheese, including queso fresco, feta, halloumi and jben that go perfectly with home-made bread, membrillo and pomegranate molasses. There is a huge sense of satisfaction in being able to offer friends and family home grown organic produce. 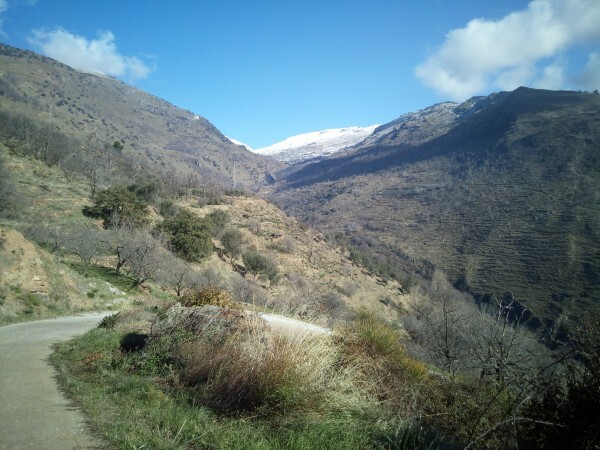 Casa Nevada has the best of all worlds, whilst enjoying incredible scenery, off the beaten track, it is only 3.5km from the bustling spa village of Lanjaron, a mere 45 minutes from Granada and the Costa Tropical beaches and just over an hour from the Sierra Nevada ski resort. Lanjaron is a typical working Spanish village with the added bonus of a wide range of amenities to cater for the tourists that visit the village for its health giving waters. The Balneario offers spa treatments, whilst during the summer months in the park there are music concerts, outdoor cinema, flamenco and much more. Further afield La Alpujarra is known for its little white villages, hiking trails, artisan products and amazing wildflowers. 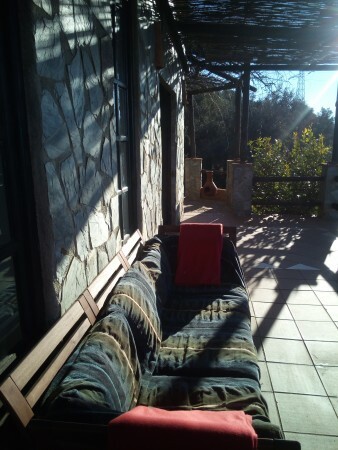 Lanjarón is located 1 ½ hours from Malaga airport and 45 minutes from Granada airport, giving plenty of options, for family and friends to visit. Car hire is available at both airports as well as bus services.